Currently each business and premises have their own arrangements in place. This has led to a situation where there are several collections each day of every week by many different contractors. This seems crazy and very inefficient. The result…. lots of bins , all times of the day or night, tipped over by drunks and overflowing with rubbish, moved around by photographers, filled with rainwater and invaded by rats. Would it not be better to have a single contractor manage the whole area? Many of us think so. First we would need to do an audit of existing contracts, then we can go to tender and select one contractor to cover all. All you need to do is let us know who your current contract is with, what days your waste is collected and when the contract expires. 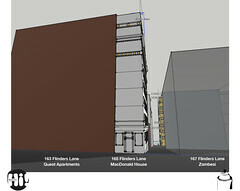 Some other thoughts about solutions for waste collection in Hosier Lane and beyond are discussed further here. Thanks for this, as soon as I have a confirmation of permission I will go public, it is then that I will have a better idea of what “is” happening and can report on it. Great meeting with both you and Kerry – I believe that if more of the stake holders and suppliers meet, we will find that there are even more projects and concepts that are being planned. I look forward to a general meeting and starting the waste project. 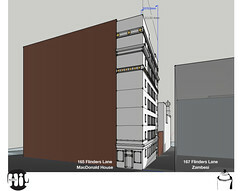 Hi Robyn – great to meet you and hear of your ideas and progress in relation to Rutledge Lane. Would you consider posting these projects along with calendar notes on the ‘Wall’ or ‘Brainstorm’ sections of this site? 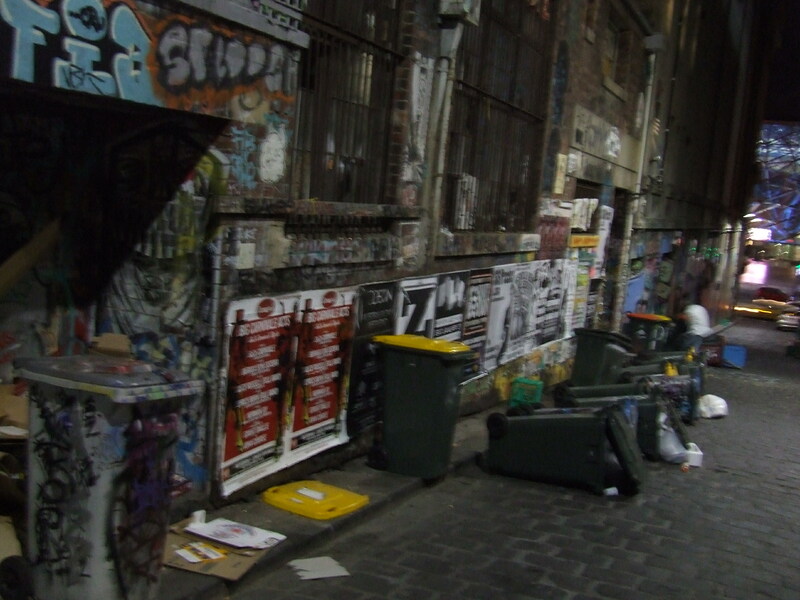 unsure of whom “Hosier Lane” is, – are you a resident of the laneway, and artist or maybe a business owner/ your identification would be appreciated? The blog is excellent and you have really done a wonderful job of getting zone attention. I am currently semi communicating with the council about rubbish, after finally finding the right person to deal with – especially for our residential rubbish both binned and hard. It would be appreciated if maybe you could give me a call and then maybe we could arrange a meeting with the council reps involved – thanks for editing my discussion point above I trust that you still have all the details? Are you aware of the new regulations that are coming into force after June 30 regarding collection in the CBD? Looking forward to a meeting? Sorry Robyn, My name is Kerry and I am a resident and I also work from home some days. The ‘hosierlane’ name is just for admin on the blog. How crazy is it that your building, our building and at least 2 others have been working through the same minefield at Council trying to find someone to talk to over such a long period… Lets try to meet this weekend some time. I assume A/H is better for you too?? I will call you off-line later today. The IDEA of a single system is wonderful, in actual fact, this is what the council currently provide, however NOT on a daily basis. As a resident, I pay rates to have my waste removed by the council – these are quite hefty in comparison to rates paid by friends in the suburbs who own houses, I choose to live in the city in an apartment, so I accept that this is part of my choice. Unfortunately, if the single system came in, I would then be hit with an additional cost associated with paying for garbage collection and this new system ( are we involving the council and if so do our rates cover these costs?). 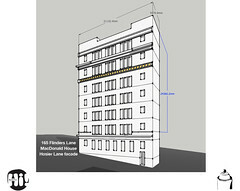 How would we manage this without asking the residents to pay additionally for this new concept? We currently have 10 bins that are placed on the lane twice a week in the evening prior to collection – please realise that Movida have been extremely patient with this process and assist us with this placing so our bins do not interrupt their client base enjoying their dining experience. These bins get a bit beaten up by taggers and artists that need height to work on pieces above their statue – we accept that our bins are public fare once they are on the street, but we store them when they are not ready for collection. Would I be able to suggest a meeting of the zone interested parties to get on with this rather than talk about it, there is too little time before the council start instituting new policy without our input? Sure Robyn, love to get a group together to discuss. It is great to have someone from the Cosmopolitan on the blog, I have not been able to make contact with your building until now. Re the single collection contract, my proposals to Council so far are for this to replace the all existing contracts (including the Council collection) and therefore would not be an additional cost to residents. We are a way off from this happening but I am confident it can. This is a forum for everyone who lives, works or plays in the neighbourhood of Hosier and Rutledge Lanes. We all have an interest in the amenity of the area and a passion for everything that makes it such a jewel in the CBD.